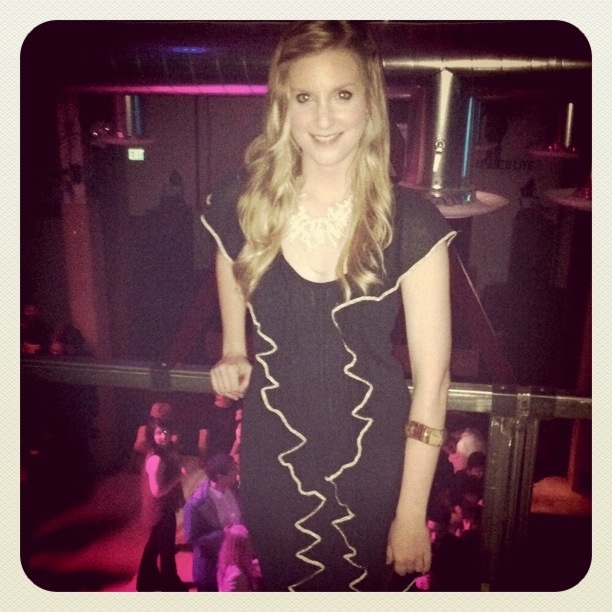 Last Thursday, I attended the Refinery29 SF launch party and mingled with San Francisco’s fashionistas and ‘os. A few days before the event, I had my usual mini panic attack (like most girls do before an event) and remembered coming across the cutest dress from a recent email sent over by A|X Armani Exchange about their event at Coachella. Only a few days before the Refinery29 SF launch party, I raced over to the store and bought the Flutter Sleeve Mini Dress by A|X Armani Exchange that caught my eye while going through my inbox. Saved! All in all, it was an awesome night and the dress was perfect for the party. Wondering if there are any other fun ways to wear the dress? Check out Vanessa Hudgens below as she belted the dress and slouched it down below her shoulders for a more casual look. Find even more casual “music festival style” below on celebs like Penn Badgley, Kellan Lutz, Ian Somerhalder, Jamie Chung, Nina Dobrev, Shiloh Fernandez, Heather Hemmens, Jessica Stroup, Matt Barr, Taryn Manning, Evan Ross and Marielle Jaffe. They all showed off their best festival fashion in Armani Exchange last month in Indio, CA, throughout Coachella’s countless shows and soirees. And on Saturday, April 16, A|X Armani Exchange and 944 Magazine hosted the second annual NEON CARNIVAL in Indio, CA. When they weren’t hitting the dance floor, guests enjoyed carnival games and rides like bumper cars, kite runners and slides, and noshed on old-school carnival snacks. Also featured at the festivities: Case–Mate provided a photo booth for guests to snap shots and capture the memories as they were displayed on the hangar wall. 5Gum dished out treats for guests to enjoy while Jose Cuervo Platino and Ciroc Vodka kept the soiree alive well into the morning hours with each of their signature cocktails. Sounds like a fun time and a great way to bring fashion and music together through timely events! Check out all the style below and tell me what do you think of this trend! How would you “rock” it? All items above are available at Armani Exchage Stores and online at www.armaniexchange.com. GET THE LOOKS: Vanessa Hudgens: Flutter Sleeve Mini Dress; Heather Hemmens: Jungle Burnout Shirt; Jamie Chung: Sheer Rouched Jacket; Nina Dobrev: Bahama Print Maxi Dress; Marielle Jaffe: Pieced Bikini; Heather Hemmens: Quilted Cross Body Bag; Jamie Chung: 20th Beaded Shift Dress; Jessica Stroup: Metallic Bandeau Mini; Shiloh Fernandez: Hooded Linen Shirt; Kellan Lutz: Dark Wash T-Shirt; Penn Badgley: Space Stripe Henley; Penn Badgley: Yarn Stripe Henley; Kellan Lutz: Straw Fedora; Penn Badgley: Linen Utility Shirt; Solar Remix Sunglasses.